Designed with both precision and modularity in mind, the MRAD is equally at home on the range or on duty. 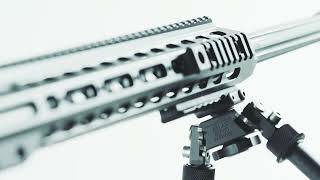 Its monolithic upper receiver is machined from 7000-series aluminum, including a full-length M1913 Picatinny top rail with built-in taper for long range precision. With mounting slots at 3, 6, and 9 o’clock, its hand guard offers a rigid, highly adaptable interface for attachment of rails, electro-optics, and other accessories. Featuring a user- changeable barrel system, the MRAD can quickly and easily be converted to one of 8 different calibers or multiple barrel lengths by simply loosening two bolts using a standard Torx wrench; no gunsmith required. Contained within the lower receiver is a fully adjustable match-grade trigger module, allowing the user to easily set their ideal pull. The MRAD stock folds on the right side, reducing overall width for a minimal footprint and ease of transport. When extended, the stock locks securely into place, providing an interface as rigid and stable as any fixed-stock rifle. With tool-less length of pull and cheek piece height adjustment, the MRAD is easily configured to fit shooters of all shapes and sizes. The use of ambidextrous paddle-style magazine release, left/right swappable thumb safety and AR15/M16 pistol grips makes the MRAD perfect for both right and left handed shooters. From competition to combat, the Barrett MRAD does it all.